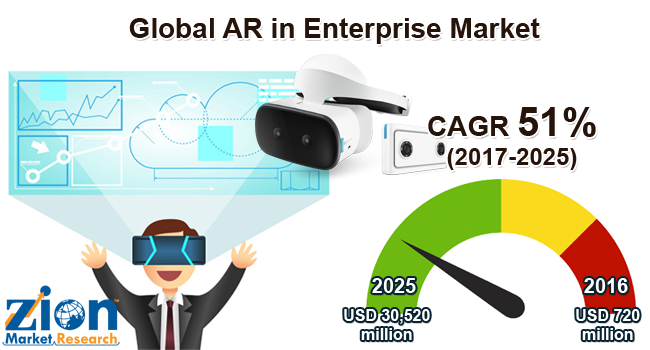 With the presence of a large pool of participants, the global AR in enterprise market is displaying a highly competitive business landscape, finds a new research report by Zion Market Research (ZMR). CyberGlove Systems LLC, Google LLC, Samsung, Upskill, and Wikitude GmbH are some of the key vendors of AR in enterprise across the world. These players across AR in enterprise market are focusing aggressively on innovation, as well as on including advanced technologies in their existing products. Over the coming years, they are also expected to take up partnerships and mergers and acquisitions as their key strategy for business development states the AR in enterprise market study. Citing an instance, on August 14, 2018, StarVR today, a leading player that offers premium virtual reality solutions for enterprises, unleashed StarVR One, a next-generation VR headset of the firm designed to support the optimal life-like VR experience for fulfilling business needs of an enterprise. As estimated in this report, the global AR in enterprise market stood at US$ 720 million in 2016. Witnessing a tremendous rise during the period from 2017 to 2025, the revenue in this AR in enterprise market is expected to reach US$ 30,520 million by the end of the forecast period. The main components available in this AR in enterprise market are hardware and software components. Among the two, the demand for hardware is relatively higher and the trend is anticipated to remain so over the next few years, notes the AR in enterprise market research report. “Escalating demand for augmented reality systems in manufacturing, education, and retail sectors is anticipated to propel the progression of AR in enterprise market in the ensuing years,” says the author of this study. Apart from this, the augmented reality helps in time conservation and enhancement of product & work quality. The high costs of software and devices used in the AR technology have resulted in low interest displayed by small & medium scale firms in the implementation of this technology. This, in turn, is projected to hinder the expansion of AR in enterprise market within the span of few years. Furthermore, deficient knowledge about the technological applications will also obstruct the growth of AR in enterprise market. Regionally, North America has been leading the worldwide AR in enterprise market and is anticipated to continue on the dominant position in the years to come, states the AR in enterprise market study. The early adoption of new technologies is the main factor behind the dominance of the North America AR in enterprise market. The high number of market players being headquartered in North America is another significant factor that is supporting this regional AR in enterprise market.